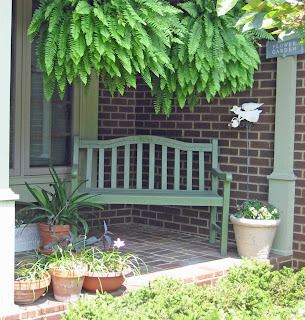 Come sit up here on the porch next to me and let's chat over a a tall glass of your favorite iced beverage. Awhile back, I boldly declared that we should all embrace weeding, because no matter where you garden, weeding has to be done. There is no magic answer to controlling weeds that doesn’t require some effort. There just isn’t. Oh sure, some methods of weeding and controlling weeds require less effort, but you will never be entirely free from weeding as long as you garden. I can promise you that, so embrace it for a happier life! I’ve been doing a lot of embracing of weeding this season, and yet it doesn't seem like I'll ever get caught up on my weeding. All the rain we had in May and June have caused every weed seed within the top two inches of dirt to germinate. Even my container plantings, filled this spring with fresh potting soil, seem to have more weeds this year. The weeds are having a great year. Fortunately, the plants I chose to put in my garden are also having a great summer, so it all looks nice and green. Just don’t get too close, or one of those thistle weeds (see below) might scrape you. Did you ever wonder why sometimes you can walk by a little weed day after day, thinking each time you see it that you ought to pull it? It would only take a few seconds. But you don’t pull it for so many reasons. And then one day you look down (or up!) and realize that the weed has gotten so big that you might have to rent a back hoe to dig it out. Well, maybe not a back hoe, but you do need a hori hori knife or some other tool to dig it out. How does that weed do that, sit there looking tame and innocent until it gets big and mean? I guess it is part of their way of surviving, of living. Those weeds can teach us something about living. Weeds aren’t fussy about where they end up. They will grow anywhere under less then ideal conditions. They make the best of it. Do you need to have ideal conditions to do your best, or do you make the best of whatever conditions you find yourself in? Weeds accept a helping hand. Birds eat the mulberries, birds poo purple mulberry droppings with the seed included and the little seed quickly sprouts to establish a new, weedy mulberry tree. They accept the help of the birds. If they didn’t, all the seedlings would be competing for space right under the original mulberry tree. Do you accept a helping hand when one is offered? Weeds come up with alternate plans. Even if a bindweed vine never flowers and sets seed, its back up plan is to grow up from the roots, again, and again, and again. Do you have an alternate plan if your first plan doesn’t work? Weeds grow quickly and get right to work. They take full and quick advantage of the sun, rain, and freshly dug earth. Do you get right to work when you can, when you have a WOO to do something, in the garden or out of the garden? Weeds don’t give up. Some weeds grow back from the tiniest piece of root left after you’ve pulled them. Or their seeds lie dormant for years, waiting to be turned up in a scoop of dirt and shown the light of day so they can germinate. Do you give up too easily? Weeds do have a purpose, even if it doesn’t seem obvious. They are plants, after all. They quickly grow on bare soil which helps stop erosion. They provide food and shelter for birds and all kinds of critters and insects. And they can be pretty in their own way with blooms as attractive as many cultivated plants in the garden. And they can teach us a lesson or two or five about living. Can you think of any other lessons we can learn from the weeds? You might also be interested in other lessons I’ve learned from gardening… from the peas and from the hoes. I've learned where to grab thistle bare-handed and not got stuck. It's a necessary skill around May Dreams Gardens, home of the thistles. Thanks for stopping by to sit and chat on the porch. On your way out, could you pull that little weed over there? Yes, that's the one. Thanks! Very existential post, I like how you've taken something that drives most people crazy and shown us another side of the coin. I'll take a green tea. what a great blog post, and so near and dear to my heart, since the weeds in my garden are having a great year also. Weeds have a work ethic that can't be beat. As you said, they don't give up and they keep on going no matter what the conditions. Have you noticed they don't care what anyone thinks of them either? Ah, you must have gotten into the Zen of weeding to have achieved this enlightenment. According to VIS, I am a delicate flower. I'd like to be more weedy. I can't help myself, when I see a weed seedling, I have an overwhelming urge to pull it. I'll be happy to get yours. Great post Carol. In my own garden beds, I try to do alittle weeding each day so that the weeds don't take over completely. It has been a weedy year in my garden too, we've had quite alot of rain for this time of year and the weeds love it as much as the plants. Certain weeds only grow in certain kinds of soil. I know there is at least one book out there, Weeds and What They Tell, that explains what you can learn from the presence of certain weeds. My weeds are thriving while everything else bakes and shrivels in our heat and drought. Why is this? And why don't we want to grow the weeds instead? While seeing the state capitol and viewing the grounds with visiting relatives, I noticed some weeds in one of the flower beds and just had to pull them as any good gardener would. I was approached by a DPS officer and was told to stop stealing the plants. I had to explain the difference between the weeds and the flowers to him. He said to stop any way. I told him as a gardener the urge to pull weeds was almost irresistable. He smiled and said the urge to take me to jail was almost irresistable as well. Police, what do they know about weeds? What a great post. It almost makes me like weeds. Almost. Having spent a few hours today on weeding (including that oh-so-persistent bindweed), I do have a healthy appreciation for their hardiness. Little bastards. I may have to post this post in my counseling office! (Carol May I?) Many of my clients are gardeners! Some of my weeds like to camouflage themselves to look like the plant their growing into. I don't recognize them until they are ready to set seed, and luckly pull them out. It's a battle, I wish my flowers grew as stong as my weeds. I think of that quote every time I weed. What I 've learned is that there must be other life out there in the universe. One need only watch the persistent attempts at life by weeds to know that given even the tiniest of chances life will form. One lesson I've learned from weeds is to take advantage of opportunities for growth wherever you can. I'm with Dee, though, I don't always enjoy these lessons! You know, I've come to appreciate weeds in my yard. I pull them if they're hurting an intentional plant, but if they aren't bothering anyone I tend to let them be. I guess I've become more relaxed since we moved to the countryside. I was constantly out weeding in my old gardens in town, but the weeds always came back stronger and better than ever. 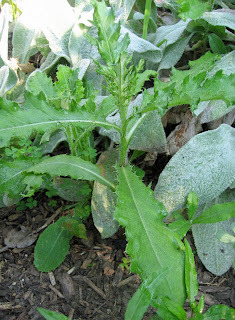 What makes weeds so unwelcome anyway? Very timely post Carol. While walking about the yard this afternoon, I saw the new little border in the back of my yard under the mulberry tree has sprouted thousands of tiny mulberry trees. I was thinking to myself it was a mistake to plant anything there - better to have left the sparse grass in that spot and let the mower do it's thing. Maybe I should have started with an alternate plan. But when I get myself back there to get rid of all the little sprouts, I'll take advantage of the mindless chore to spend some time thinking about all the excellent lessons in this post. While I'm doing that I might also think about jumping ship and moving those plants into a more hospitable, lower-maintenance spot ;) While I'm thinking about that I'll remember to ponder whether I give up too easily, as I fear the answer to that question may be 'yes!' And I'll definitely be thinking that if DH offers to help me get rid of all those mulberry seedlings, I'll accept the helping hand! How long and how many times did you get stuck before you learned how to pull it? I just discovered how to do it last week. After getting stuck several times. Another great post; I always wondered why weeds can thrive with neglect, but so many "flowers" need TLC to survive. We can all learn a lesson from the weeds. By the way, would you share your tip for pulling thistle bare-handed? Even with gardening gloves on, I always manage to get stickers in my fingers. Thank you all for coming by to sit on the porch and have a nice chat about weeds. Funniest thing... at church Sat. night, the priest showed a gnarled up looking plant that he said workers had found growing in one of the old brick chimneys of this very old church. The roots of it were wedged between some bricks and as it continued to grow, the roots were acting as a wedge, splitting the chimney. I looked at it after church, it almost looked like a bonsai tree. Guess what it was? That's right, amulberry tree. Those suckers will grow anywhere! Where's the oddest place you've ever seen a weed try to grow? I've always got to laugh at trees growing in people's gutters. It can look like a mini forest at times. While Herself may think of the quote "Nature abhors a vacuum" every time she weeds, I think of it when I look at the kitchen floor & notice how much Nature & I are alike. Wow you can pull them without gloves!!!! I had to go buy leather gloves just to be able to pull those babies.